ANNE GREENE here. Women served in other areas than test piloting wounded and repaired planes to be sent back into the war. For an exciting read about such women pilots, the WASPs, order my book, ANGEL WITH STEEL WINGS soon available on Amazon. LEAVE A COMMENT AND GAIN A CHANCE TO WIN A FIRST AUTOGRAPHED COPY OF ANGEL WITH STEEL WINGS. 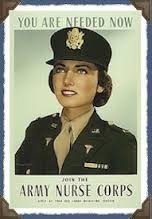 During WWII, women became nurses to get into the action. The Army and Navy Nurse Corps recruited 74,000 women throughout the war. 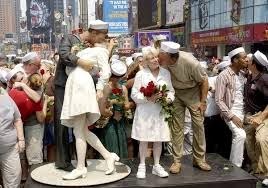 Where ever men fought the war, nurses ministered. Nurses worked close to the front lines. 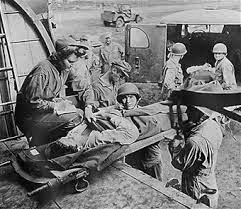 They served under fire in field hospitals and evacuation hospitals, on hospital trains and hospital ships, and as flight nurses on medical transport planes. Their skill contributed to the low mortality rate among American servicemen. Fewer than four percent of soldiers who received medical care in the field died from wounds or disease. After the Japanese surprise attack on Pearl Harbor, Hawaiian hospitals were overwhelmed with hundreds of casualties. The blood-spattered entrance stairs led to hallways where wounded men lay on the floor awaiting surgery. Nurses faced shortages of instruments, suture material, and sterile supplies. Doctors performing major surgery passed scissors back and forth from one table to another. Doctors and nurses used cleaning rags as face masks and operated without gloves. 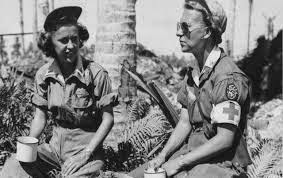 The Japanese attacked US troops stationed in the Philippines on 8 December, where one hundred nurses served. They bombed planes, barracks, and field shops. The hospital escaped damage, but the large number of casualties overwhelmed the small staff. Japanese forces landed on the main island of Luzon and approached the city of Manila. 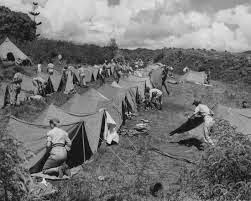 All the nurses stationed outside Manila reached the city except for two nurses stranded at Camp John Hay, who became prisoners of the Japanese. The Manila nurses evacuated to the island of Corregidor. The Japanese bombed the Hospital at Corregidor, scoring a direct hit on the wards and killing or seriously wounding more than one hundred patients. A nurse remembered the force of the bomb. "The sergeant pulled me under the desk, but the desk was blown into the air, and he and I with it. I heard myself gasping. My eyes were being gouged out of their sockets, my whole body felt swollen and torn apart by the violent pressure. Then I fell back to the floor, and the desk landed on top of me and bounced around. The sergeant knocked it away from me, and gasping for breath, bruised and aching, sick from swallowing the smoke from the explosive, I dragged myself to my feet." An appalling sight met her eyes. Patients blown out of their beds. Bodies and severed limbs hung from tree branches. Although the nurses expected more air attacks, they carried on. With surrender inevitable, as many nurses as possible evacuated to Australia. Sixty-seven nurses became prisoners of war until U.S. troops liberated them in February 1945. Sixty nurses attached to the 48th Surgical Hospital climbed over the side of a ship off the coast of North Africa and down an iron ladder into small assault boats. They wore helmets and carried full packs. Only their Red Cross arm bands and lack of weapons distinguished them from fighting troops. They waded ashore on D-day of Operation TORCH with the assault troops and huddled behind a sand dune while enemy snipers took potshots at anything that moved. They moved to an abandoned civilian hospital, where they cared for casualties. There was no electricity or running water, and the only medical supplies available were those the nurses brought. The hospital remained under sporadic sniper fire. Doctors operated under flashlights held by nurses. There were not enough beds, wounded soldiers lay on a concrete floor in pools of blood. The only sedatives available were the ones that the nurses carried with them during the landing. Two hundred nurses lost their lives in service to their country. By war's end, nurses received 1,169 medals and citations. Some received the Purple Heart for outstanding performance. skills and experiences. The Army had trained them in specialties such as anesthesia and psychiatric care. Nurses had become accustomed to taking the initiative, making quick decisions, and adopting innovative solutions to a broad range of medical-related problems. Society accepted nurses as professional members of the United States health care system. 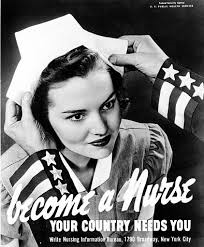 World War II changed American society and redefined the status and opportunities of the professional nurse. Would you be interested in reading a book about Army Flight Nurses? Leave a comment for a chance to win an autographed copy of ANGEL WITH STEEL WINGS. ANGEL WITH STEEL WINGS is a World War II romance where Steel Magnolias meet Band of Brothers. While doing her part test flying planes, Mandy McCabe escapes her dead-end life in Hangman’s Hollow, Tennessee as a Woman Air Service Pilot, WASP. Can she escape from her past? Major Harvey Applegate lost his wife to the WASP program, and he’s convinced Yankee Doodle Gals have no place flying in the war effort. He determines to protect the remaining ladies by sending them packing back to the home front. Both Mandy and Harvey experience immediate attraction, which increases Harvey’s desire to send Mandy home to safety. Can a man burdened with memories of death undertake added danger? Will their new love survive the test? One love. Two goals. Someone has to give. I would love to read about army flight nurses. I have always said it took a special woman to be a nurse. Even more so, a woman signing up to join the army and give her life for her country if need be. I cannot imagine and am absolutely amazed. I would certainly love to know more about these brave women. Thanks, Melanie. I so agree with you. The first I have heard of Army Flight Nurses - yes please!! Hi Mary, these women led exciting lives and were actually part of the military. I'm so glad your interested. Hi Loraine, Yes I think so too. I haven't written the book yet, just sampling the interest. But, my book, Angel With Steel Wings, about the courageous women who tested enemy-shot-down and American repaired planes of every kind and towed targets while men trained to shoot them down with live ammo is a great read. My Dad was in World War II and I love any book from that era. This sounds like another good one! Thanks. Thank you. It's exciting with a great love story. Yes, I'd enjoy reading more about Army flight nurses! Thanks for your vote, Deanna! This is a fascinating part o history that I am unfamiliar with. Always associated.WWII and women such as Rosie the Riveter Thank you for your information and I would be thrilled to win this book. The nurses book hasn't been written yet. I was taking a sampling to see if people would be interested in reading it. 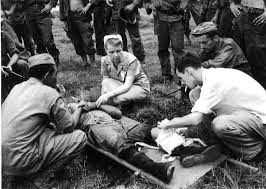 When I think of army nurses, I think of the movie "Pearl Harbor" and Kate Beckinsale using coke bottles for blood. They certainly didn't have an easy job. That was a great movie. But many of the other nurses also worked under battle conditions and under enemy fire. Nice to see you here Terri! I already knew part of what the nurses went through during WWII. But you shared a number of things in this post that I hadn't heard about. Thank you for sharing all of this. Your book sounds fabulous and I would love to read it. Thank you for the opportunity to win a copy. I hope you mean my Angel With Steel Wings book since I haven't written the book about nurses yet. Thanks for visiting with me Debbie, it's good to talk with you here. Thanks for all your research. I love learning new things about WWII that I did not know! The book sounds wonderful and I would love to win a copy. Thanks for the giveaway. Seems I wasn't clear at all that the autographed copy of my book, Angel With Steel Wings about the WW2 women test pilots is the one being given away. I'm sorry. The book about nurses hasn't been written yet. Since there is so much interest in that book, I'll consider it for the second book in my Women of Courage series. I'd planned to write one about women spies in WWII. Anyway, Betti, it's so nice to visit with you here. Sounds like a lovely book to read! Hello, I don't think I've visited with you at this blog before. Nice to meet you!! I would absolutely LOVE to read this book! 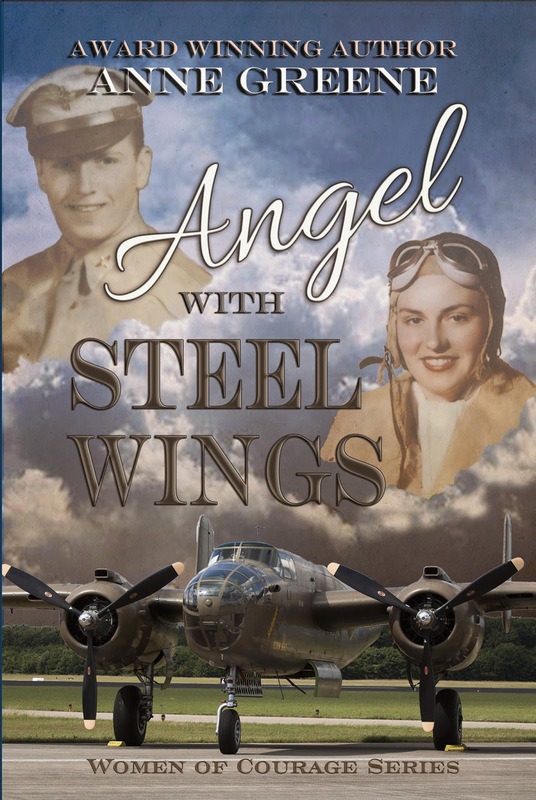 I love World War II era fiction and would be thrilled to win a copy of Angel With Steel Wings! Thank you so much for sharing this wonderful post and giveaway opportunity! Hi Britney, Great to see you here again. I love seeing ladies I've visited with before! Hi Anne! Angel with Steel Wings sounds like it's going to be a wonderful book and I look forward to reading Mandy and Harvey's story very soon!